The Best Arch Ride Ever! Thanks for the Best Arch Ride EVER! Most riders ever at over 300! First time the Arch Ride has been fully permitted by the County of San Diego, all parks and jurisdictions, and property owners. Generous support of lead sponsors, the Law office of Richard Duquette, Green Flash Brewing, Jenson USA, Clif Bar, REI, Trek Superstores, Shimano, Bike Magazine, Pardee Homes, and Magicshine, Bonnici Law Group, and Fix Body Group. First collaboration beer, Arch Ride Ale, with Green Flash Brewing. It didn’t last long. We hope you got to taste it! Raised over $17,000 for SDMBA efforts and programs. The most ever! The event requires hundreds of hours of volunteer hours in order to organize and execute, as well as thousands of dollars of donated funds and products used as opportunity drawing prizes. Without our generous sponsors and donations, the event would not be the success that it has been for years! My name is Joshua Bonnici, and I had the unique position to be able to not only have my business (Bonnici Law Group) sponsor the ride and find other companies to donate items to the opportunity drawing, I also was a participant. I’m a SDMBA board member and sponsorship chair. Below, I’ll outline how the ride went as a participant to give an “insider’s view” of the event. I carpooled to the start at La Costa Canyon High School with a friend of mine, Brian, who had never ridden the Arch before (and never attempted 50-miles off road). We were able to talk my wife into driving us up, and dropping us off early in the morning so we didn’t have to leave a car in La Costa. There, we met up with another friend who drove himself, and all signed in for the ride. I was given a “Sponsor” sign for my bike, which I had not experienced before (this was my second Arch ride, but first as a sponsor). I attached it with the high-tech pipe cleaners they gave me, and off we went. A big thanks to Canari for providing the pre ride snacks and coffee! My Santa Cruz Blur LT with the sponsor banner – still clean! Rider coming up La Costa climb. Love the lederhosen jersey. 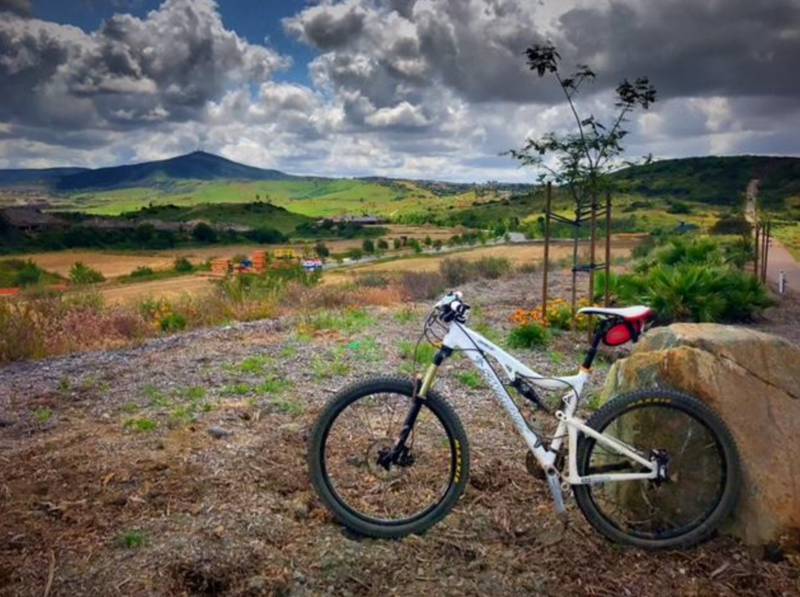 The La Costa Preserve opens up the ride, with fun, rocky single track that progresses into a good constant climb to the top. 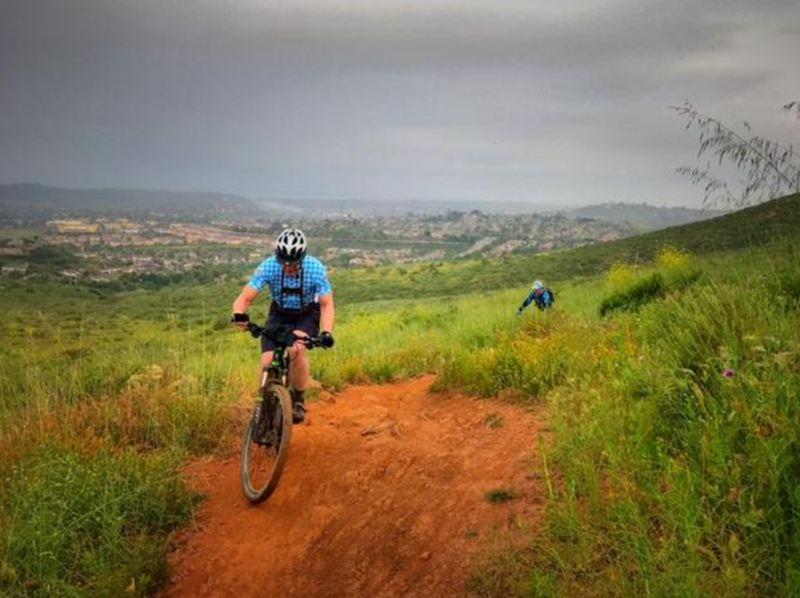 SDMBA works closely with the Center for Natural Land Management at La Costa to continue to improve and maintain these well loved trails, and they didn’t disappoint. I heard someone say that we encountered about 1,200 feet of elevation gain within the first 2 miles, and it felt like it. About halfway up, I attempted to pass someone when the trail widened, and embarrassingly “endo-ed” on a rock, sending me slowly and clumsily over the handlebars. While I wasn’t hurt, my pride took a dive, so I hopped back on my bike and scurried up the hill. At the top, I was taking some pictures and realized my glasses had fallen off during my fall. While I normally ride with “cheap” sunglasses for instances such as this, my wife recently purchased some nice $250.00 Oakley’s I was wearing, and knew I couldn’t return home without them! So, I fought my way back down to try and find them amidst countless riders climbing the hill. Somehow, I was actually able to find them, and they weren’t damaged at all! I then climbed back up the mountain, where I attempted to catch my friends who had continued on without me. Excited group at the top of the La Costa Climb! We descended the back of La Costa Preserve, crossed a bridge and hit some fire roads into San Elijo and towards Elfin Forest. We crossed a few roads, and took some trails that were opened specifically for this ride (they are on private property and normally closed to the public). A big thanks to the Elfin Forest Harmony Grove Town Council for their help is letting the neighbors know of our event. After about 9 miles, we hit the first pit-stop/aid station. That’s where the owner of ZOIC Clothing, Paul Wyandt, was pouring water in a DeadMou5 head, and had the tunes blaring. We filled up on water, some PB&J tacos (I must have had 3-4 of them) and chatted with other riders for a minute. Then I ran into my old friend Nate, whom I graduated high school with, and hadn’t seen him since graduation! 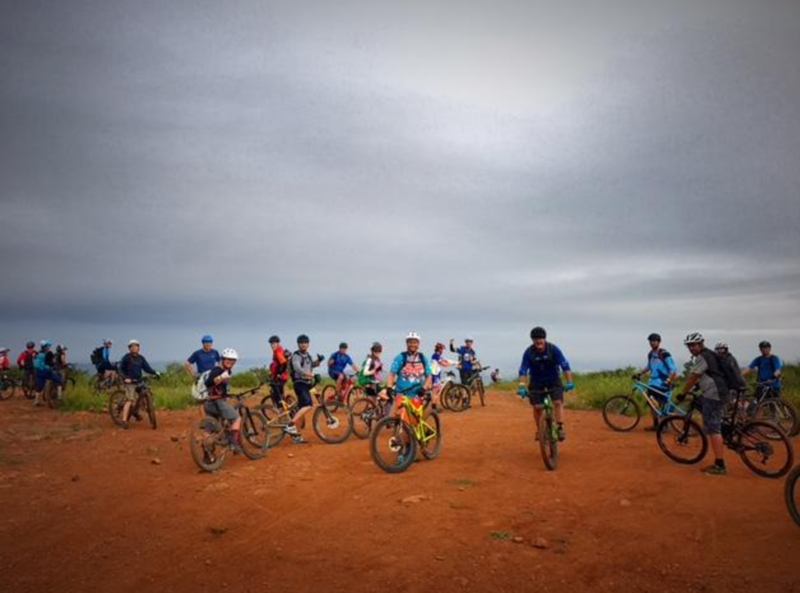 Another way mountain biking brings the community together! Also a big shout out here to El Camino Bike Shop for providing mechanical assistance at this stop. The first casualty of the day was our riding buddy, Andy, who crashed and hurt his shoulder right before the first pit stop. He was able to ride, but was taking it easy, and said he may go on forward trying to get back sooner rather than later. Total bummer. We then continued east toward the dreaded Elfin Forest Way Up Trail. Knowing that the trail was coming, I was mentally preparing myself for a grueling climb. We hit some fire roads, then dropped in next to a creek. 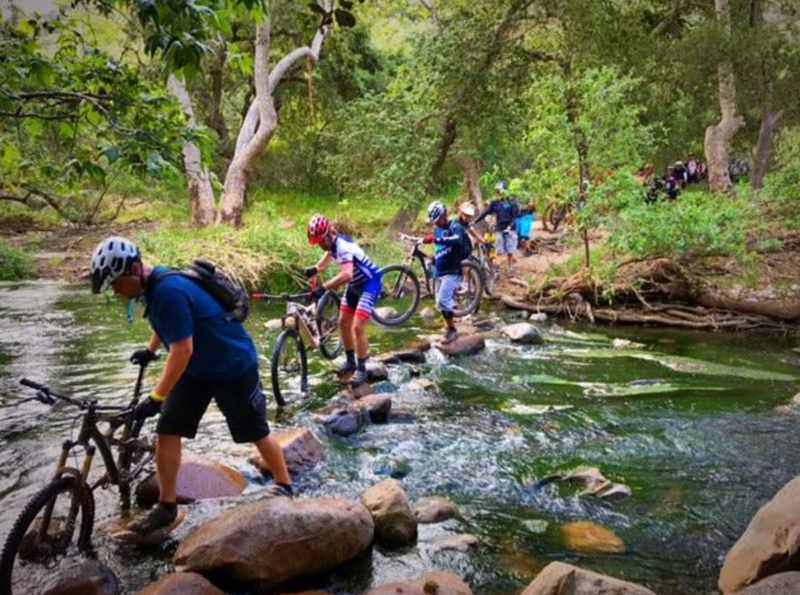 It was a lot deeper than last year because of the recent rains, and we waited in line for nearly 15 minutes while riders cautiously crossed over the line of rocks with their bikes. After crossing, we hit the trail head of the Way Up Trail. I knew this was possibly the most hiker-ridden area, so I turned on my Timber MTB Bell and started the slow climb up. We got the odd looks of people hiking down the trail, out of breath, watching us climb up the trail. To me, the switchbacks at the beginning of the trail were the toughest, as they had rock stairs built in for ease of hiking and to prevent trail erosion. Lots of bike control, low-and-slow pedaling, and concentration. I made it up the trail a few minutes quicker than last year, but it’s still a grind. 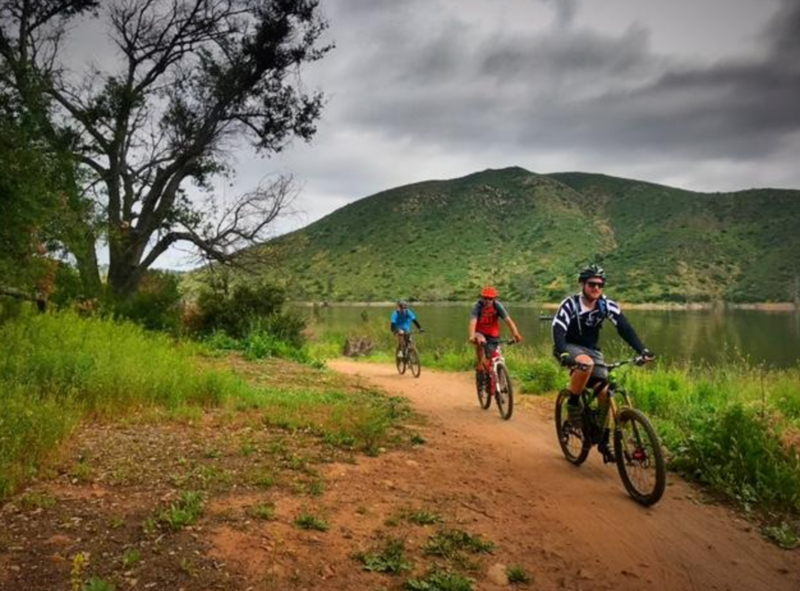 We thank the Elfin Forest Recreational Reserve staff for their support of the Arch Ride and for allowing SDMBA to help make their trails the best they can be! At the top, I admired the view with some fellow riders while I waited for Brian. A couple rangers were at the top with some water and music. Once Brian got up, we snapped a few pictures, and continued east to descend down the back side of the mountain towards Lake Hodges. Just as I knew that climbing the Way Up Trail was the toughest climb of the ride, the backside fire road I knew was probably the most dangerous. Steep, rutted, gravel and off-camber, the fire road was an inviting area for speed but was deceiving for lack of traction. I took it nice and slow on my way down, still washing out here and there, avoiding ruts and hikers who seemed unsure on how to get out of the way. At the bottom, I waited with a few other riders to cross the busy Del Dios Highway, where a CHP hired by SDMBA oversaw the crossing. This was my favorite part of the ride. I grew up riding Lake Hodges on my 5-speed Huffy bike as a 12-year old in the 90’s. I know the trails well, and they remind me of my childhood. We flew through these flowy, green trails southbound towards Hernandez Hideaway (it always smells like bean and cheese burritos there!) and the dam. 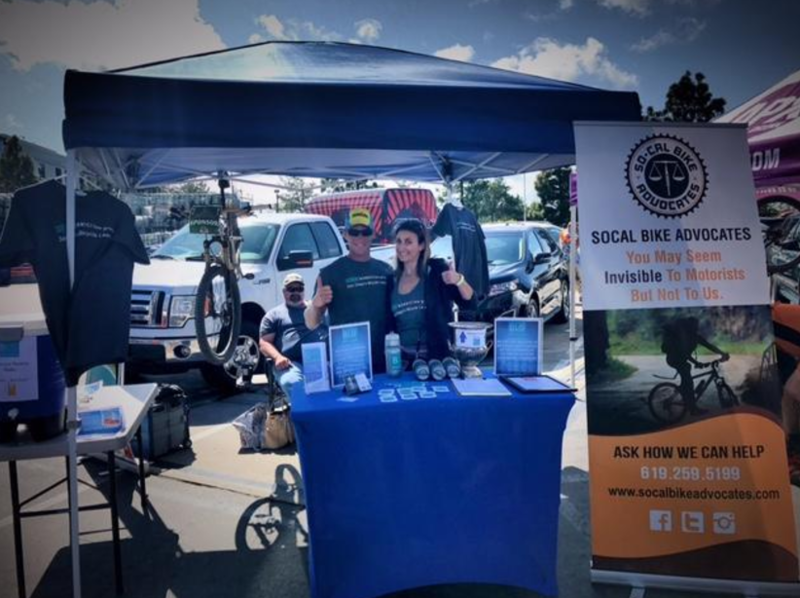 The staff and mountain bike patrol for Lake Hodges are great supporters of SDMBA and we appreciate their help in making the Arch Ride great every year! We passed Hernandez Hideaway, and took the trail towards the boat docks. Some of the prettiest trails on the ride. I stopped at an opening and took some pictures and remember riding there with my father years back. We then continued south towards the second pit stop. While waiting at the top of a climb, I talked with “the hula girls” who had some music playing, and dressed up with flowers and Hawaiian garb. They thanked me for being a sponsor, and we joked on how we could almost smell the Green Flash beer from there! Here, we regrouped again and refueled up. This station has been staffed enthusiastically by Team Ninja! They do a great job keeping everyone fueled and smiling. I had some bananas, some magic Pickle Juice Sport, and a few bars to go. Unfortunately, this is where our next tragedy struck – my friend Brian laid his bike down on a rock to get some food, it slipped, and the frame hit the rock pretty hard. I didn’t witness it, but later heard from another rider that they heard a “pop” when it hit the rock. Brian was bummed that it scratched his frame, but we left with high hopes. From there, we continued south, towards the SDRP Open Space and Lusardi Preserve. I knew from the year prior that there was some nicely built switchbacks with handrails going up the mountain. However, because of the rains, they were very rutted this year and very slow. Several spots required holding onto the railing while maneuvering the bike on the ride of the ruts. We hit both sections of the switchbacks, and climbed to the top where we overlooked some ranches and clearing skies. After a quick break, we continued onto some paved roads to connect us towards Black Mountain. After riding on the pavement for a few minutes, Brian decided to check on his frame. Once flipped over, we saw that the “scratch” had grown, and when pressure was applied, you could see the frame flex and a crack had appeared. It was there Brian made the tough decision to call for a ride and not risk injury riding on the cracked frame. We had a moment of silence, and then I reluctantly continued without him. I turned some music on my iPhone speaker, and headed off towards Black Mountain solo. Yep. More than a scratch. The views heading into Lusardi Preserve were amazing. The hillsides were deep green, with yellow and purple flowers all over. I made my way through the canyon, and up to aid station #3. The largest of the three pit stops was the a park adjacent to Black Mountain Open Space Park. SDMBA Volunteer and Trail Liaison, Matt Bartelt always is a gracious host here along with support from the crew from TASCO. Many riders took full advantage of having the VeloFix San Diego van there to keep them moving. More music, lots of food and drink. I topped off both of my water bottles, ate more PB&J tacos, and took some trail mix. Scored a Tasco hat and clipped it to my hip pack for later – because one cannot have enough hats. I caught up with my friend Nate once more, and then took off. There are usually a few extra credit sections on the Arch ride, and two of them were at Black Mountain. Once was Doug Hill (a personal favorite trail of mine) and the other was near the Glider Port at Black Mountain. I opted for Doug Hill, and climbed the fire road to the top (meeting up with the hula girls again) and snapped some more pictures. The descent down is my favorite type of riding – technical and rocky single track. I was thankful for the slack head angle and longer travel of my Santa Cruz Blur LT when it was chewing up and spitting out all the rocks. During the climbs, I was jealous of the hula girls’ light cross country hardtails (where they passed me with ease), but I gleefully passed them on the rocky descent. Top of Doug Hill, with Black Mountain in the foreground. At the bottom the single track opened to be more flowy, and into a double-track meandering through the valley. I got a nice second wind of energy, and mashed the pedals solo heading towards Los Penasquitos Canyon. Thanks to the rangers and staff at Black Mountain and Penasquitos for their support of the Arch Ride. Without the support of land managers, events like this could never happen. We entered LPC and immediately rejoiced that we didn’t have to climb Cardiac Hill this year (it’s called that for a reason). Instead, we headed towards Tunnel #4, one of my personal favorite trails in San Diego. We meandered through tight turns and green grass shaded under manzanitas and other brush, thankful for the shade. I again turned on my bell, and put my head down and climbed. I passed several riders feeling the fatigue of nearly 35 miles of trail behind them, and now getting to some technical and rocky climbs with little room for error and low head clearance. After stopping once for a quick rest and picture, I powered my way up with a few grunts for extra help. 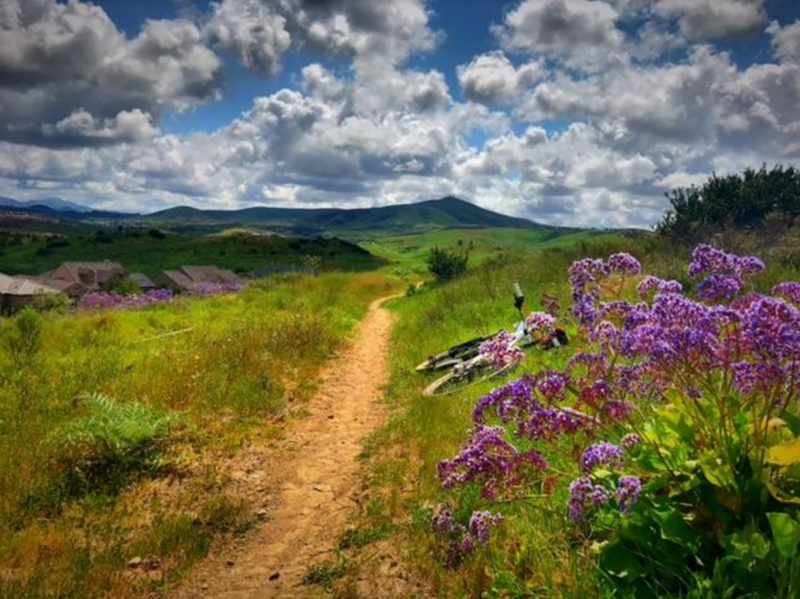 A BIG THANKS to all the great people at SDMBA who worked with many different jurisdictions for years for getting many of the Tunnel trails open and authorized again after years of closures and tickets. 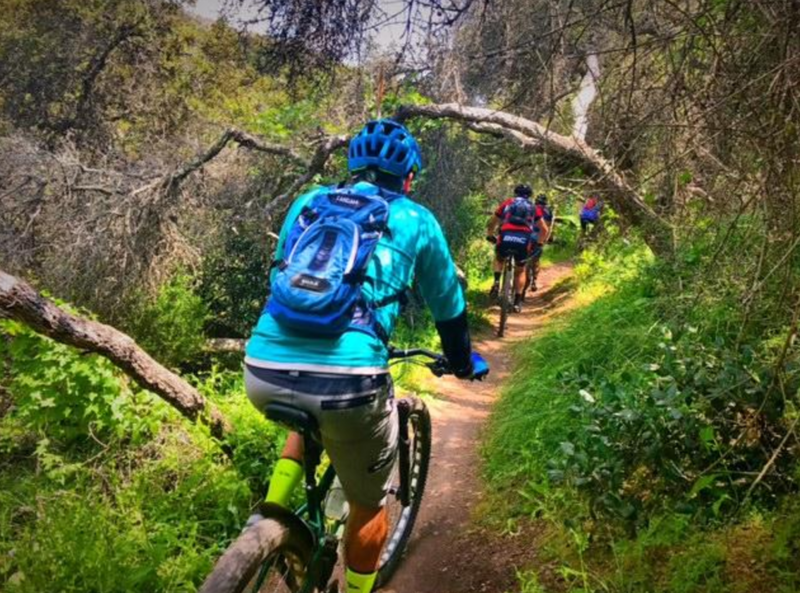 Some of the best trails in SoCal! Up on the Mesa, we wrapped around to the Bow Tie trail, and connected it towards The Shitz trail. We climbed out to the top of Cobbles (which was extra slow with my heavy tired legs) then hit the new trail of the Upper Cobbles Extension called Appendix. 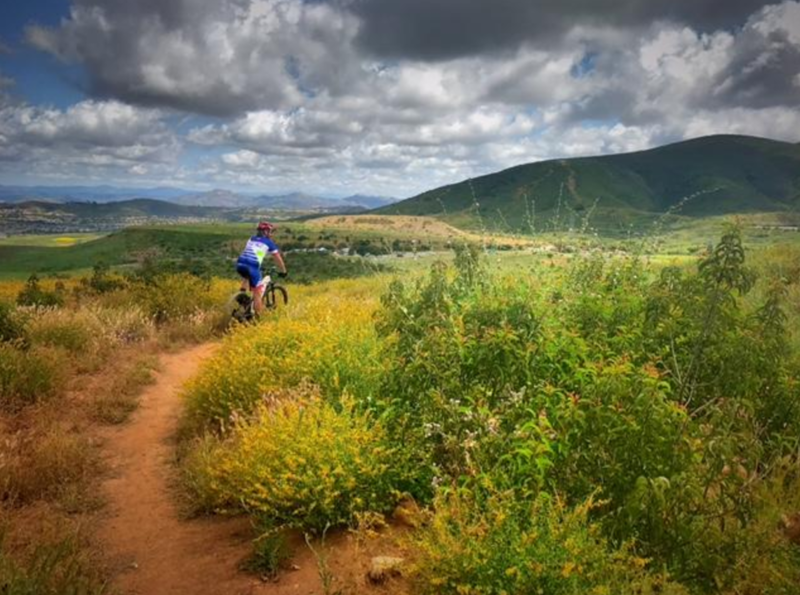 This 1.5 mile trail was built just over a year ago by SDMBA volunteers with help from the IMBA Trail Care Crew and Pardee Homes, and is a fun roller-coaster ride all throughout a small canyon. From there, we headed west along the power line roads towards Side Hill. I never really enjoyed Sidehill trail much (I had a bad experience once) but found it to be pretty rutted and choppy from the last rains. After getting beat up on Side Hill, we continued in the main canyon knowing that beer and celebration was close! With the rains, many of the bridges in LPC washed out completely from the rapid rise in water levels. The Wagon Wheel crossing is the last major bridge for the creek at the most west end of the park, and had suffered terrible damage. However, the rangers and Boy Scouts did an amazing job in replacing the bridge prior to the Arch Ride, and put in a great suspension style bridge. It was fun watching riders cross it, and bounce around as the middle of the bridge wiggled and bounced from the wright and movement of the riders. After crossing it, we made out way up and around the trail, past the parking lot, and took Lopez Canyon Trail. The climb up Lopez Canyon isn’t terrible, but after 40+ miles, it can be pretty darn sluggish. People were walking, cramping, sitting the shade, anything they could to finish the ride strong. As I passed, I tried to high-five other riders and motivate them that beer was right around the corner. At the top, knowing that the worst was over, a sense of relief and pride flowed over me. I rode through the industrial park for what seemed like forever, until I heard the cheering and music from Green Flash. I sprinted across the street, and into the driveway where what seemed like a dozen people acted as the welcome party to a bunch of sweaty and dirty riders. What a way to end! I pulled up, and dropped my bike at my booth at the entrance of the driveway, kissed my wife, and checked in for food and drink tickets. From there, I hung out at my booth handing out protein shakes, water bottles and caught up with other riders as they trickled in. My wife and friend Evan manning the booth while I rode! I rode my post-ride high for a while, but as the beer kicked in, I started to feel the fatigue from the nearly 50 miles, and over 5,000ft of elevation climb. I congratulated my friends and other riders, and just basked in the fun of the post-ride party. There was great food prepared by Green Flash along with the beer garden, stretch area from a local PT clinic Fix Body Group, and live opportunity drawing chock full of great swag from many, many sponsors. Green Flash even made a special tropical Arch Ride Ale to make for extra special post ride refreshments. It didn’t last very long! 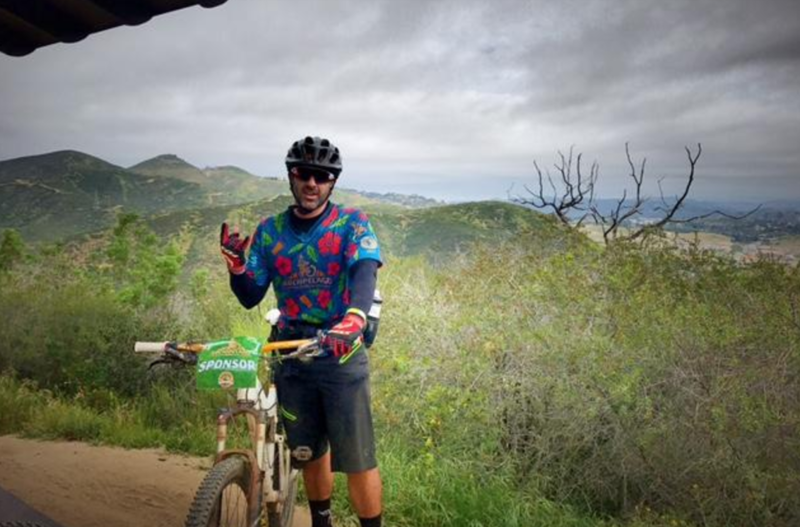 Thanks also to the Big Bear Trails Foundation, APX, Pickle Juice Sport, Zoic Clothing and the San Diego County Bicycle Coalition for providing bike valet service. People milled amount, telling of their adventures on the ride, spills, and friends they made while riding. 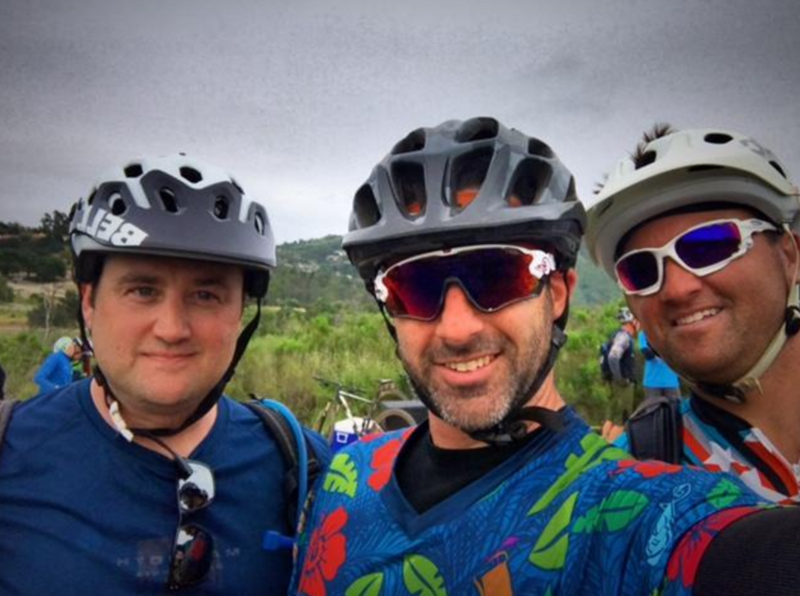 All in all, SDMBA did an amazing job organizing the event and making sure that all the riders had a fun and safe time on some of the best trails San Diego has to offer. To all of our sponsors, partners and donating entities, THANK YOU for making this event the best one yet! 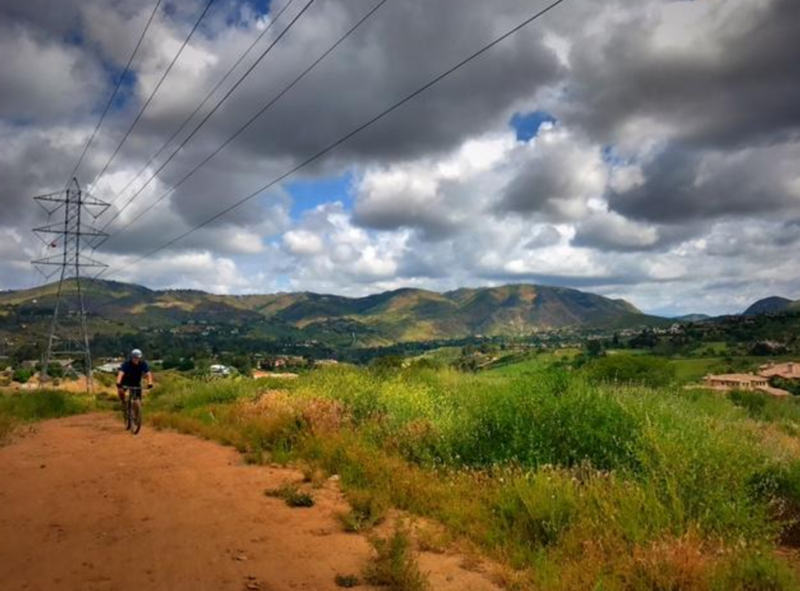 It was with your help that we were able to raise an essential $17,000.00 in order to continue our mission in preserving, repairing, and building trails all over San Diego.